from 40 pcs. 0.66 CHF ea. from 80 pcs. 0.64 CHF ea. from 160 pcs. 0.63 CHF ea. 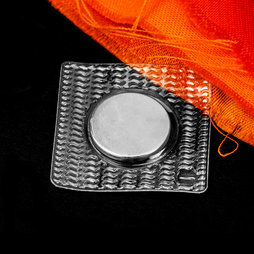 These are disc magnets (18 x 2 mm) with an adhesive force of almost 2 kg, shrink-wrapped into a square PVC cover. They can be sewn into clothing or used in wet surroundings without rusting. A sales unit contains a strip with 5 magnet pairs, which equals 10 individual magnets. Application: A tailor sews a blouse for an older woman. She should be able to open and close the blouse with one hand. This is where sew-in magnets come in handy as an alternative to buttons. One magnet in plastic cover each will be placed on both sides of the blouse in between two layers of fabric and then carefully sewn in. When they are sewed-in, the magnets are practically invisible.